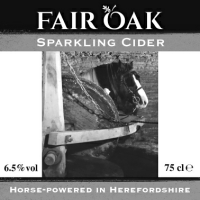 All of our Fair Oak ciders are made using a blend of traditional cider apples. The flavours and proportions vary slightly from year to year, depending on the weather, and the fruiting cycle of the trees. There are hundreds of different cider apples, described as bittersweets, bittersharps, sweets or sharps*. Bittersweets and bittersharps are high in tannin; bittersweets have high sugar levels and bittersharps are more acidic. Sweets are quite similar to dessert apples; and sharps are more like cooking apples. Dabinett is a full bittersweet cider apple, probably grown since the early 19th century. It is small, greenish yellow, flushed and striped with red, and has a strong aroma when ripe. It produces sweet, astringent juice, and a bittersweet cider with soft, full-bodied astringency. Foxwhelp is a bittersharp apple which has been known since the 17th century. It is bright red, and on its own produces cider with a musky flavour and strong aroma. It is more often blended with other apples to give strength and flavour. Kingston Black is a bittersharp, thought to have been discovered at Kingston in Somerset in the mid-19th century. It is small, with a dark maroon flush, and produces a full-bodied cider with a distinctive flavour. Yarlington Mill is a medium bittersweet, said to have been found in Somerset in the early 20th century. It is a small, pale yellow apple with a red flush, and produces sweet, slightly astringent cider with a good aroma and flavour. Small quantities of other apples, such as Bramleys Seedling, are also added to our mix. The difference between our four ciders is subtle. 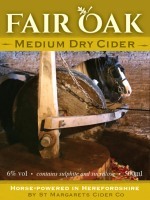 After fermenting out, our basic cider, with nothing added at all, is MEDIUM DRY, with a mellow, not bone-dry, flavour. 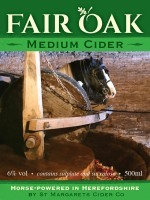 The MEDIUM and SWEET ciders have minute amounts of sweetener added – much less than is used in commercial brands – giving the MEDIUM a smooth, refreshing, full-bodied taste, and the SWEET a satisfying flavour of traditional farmhouse brews. Our new SPARKLING cider is made by filtering and carbonating the medium dry cider, to make it gently sparkling and crystal clear. * For more information, see The New Book of Apples by Joan Morgan and Alison Richards, Ebury Press.